In the past few weeks I’ve been talking fairly regularly to George Glasgow Jr, of GJ Cleverley in Los Angeles, for some articles in The Rake. I find it interesting what his Hollywood clients order – given that few of their contemporaries wear smart shoes. 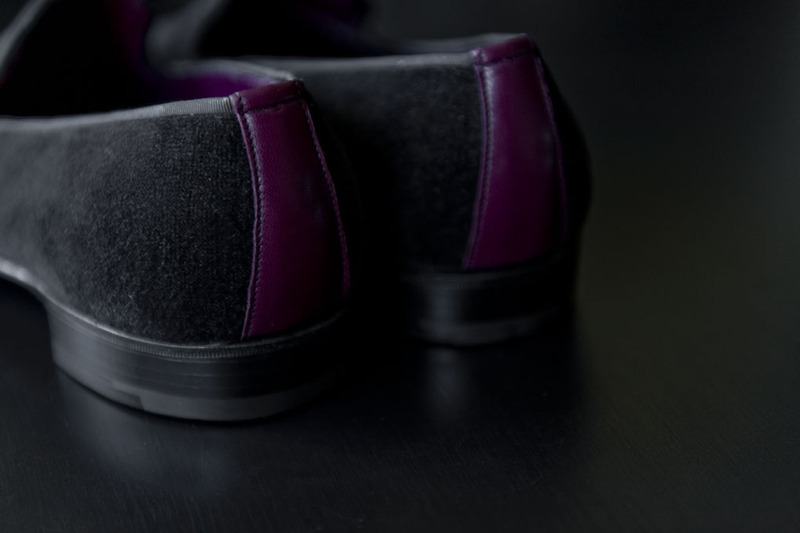 The answer appears to be casuals, so suede and slip-ons, plus one or two very smart pairs for black tie. And in this case, some rather nice slippers. These were made recently for Mickey Rourke. He designed the monogram and picked the sole, in-sole and lining colours, as well as specifying a blind welt and very thin soles. Being an Albert slipper, the soles are glued, but the shoe is hand lasted as with any other bespoke pair. 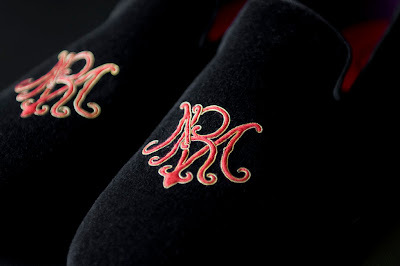 Apparently Mickey has another pair on order, with red piping and gold initials. Plus a further 12 pairs of regular shoes. It’s better than spending it on Armani I suppose. Beverly Hills: April 27th, 28th, 29th & 30th. You can follow the discussion on Mickey Rourke’s bespoke slippers by entering your email address in the box below. You will then receive an email every time a new comment is added. These will also contain a link to a page where you can stop the alerts, and remove all of your related data from the site. 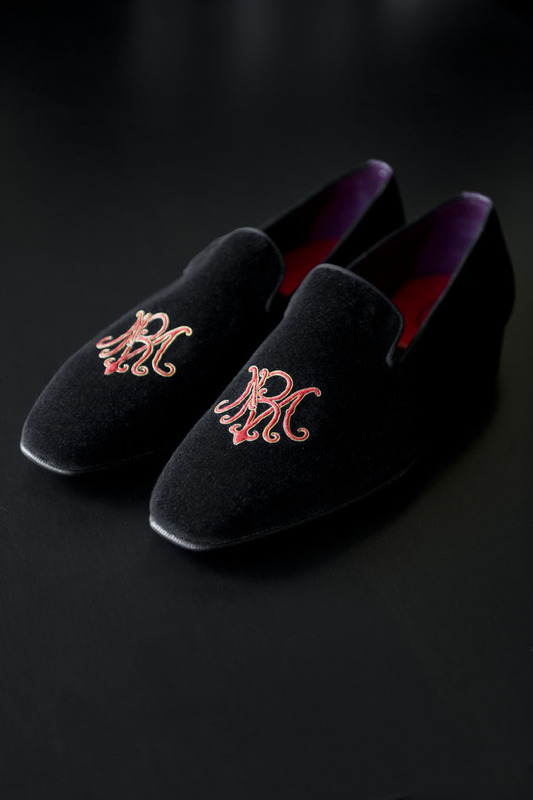 Beautiful Slippers, Del Toro also do great mens slippers, available in linen and suede for the more adventurous of men. Stubbs and Wotton, Shipton and Henage, Churchs, where else do good slippers? 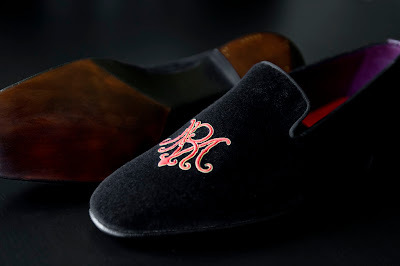 Americans wear slippers like these out, onto the streets, into the evening, and Palm Beach is full of men in black tie with these things on their feet. I have a feeling they don’t realize that they are made for the home, by the fireplace. Am I right? Or are we now to condone this style? No, I agree Paul. Other than wearing them down to the bar of the hotel I’m staying in, or a friend’s house when staying with them, these remain strictly at home for me. Apart from anything else, they won’t last long outside. And that would be a crime with Cleverley bespoke. Where in Chicago Mr. George Glasgow Senior will have a trunk show on May 16-17, 2016?